Carrot Muffins have the look and flavor of a carrot cake only they are in muffin form. The original name for these muffins was 'Morning Muffin Magic' but you may also know them as 'Morning Glory Muffins'. 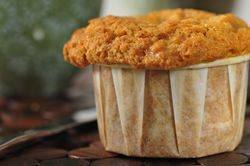 These cinnamon scented muffins are nice and moist and are loaded with flavorful ingredients; things like toasted nuts, sweetened coconut, grated apple, and grated carrots. Although these muffins need no adornment, sometimes I can't resist smearing them with a little cream cheese icing. The pitfall with all muffin batters is in over mixing the batter and ending up with a tough muffin. So make sure you only mix the batter until the ingredients are combined and moistened. A few flecks of flour are fine. To make the job easier, plus to give the baked muffins a nice doomed shape, use an ice cream scoop to fill the muffin cups. Of course, if you do not have one, two spoons will do the job. As always, if you want standard sized muffins, only fill the muffin cups 2/3 full with batter. However, if you like your muffins with a crown, fill the cups almost to the top. Just make sure to grease the top of the muffin pan so that as the batter overflows it does not stick to the top of the pan. And don't forget to fill any unfilled muffin cups with a little water to ensure even baking as well as preventing the pan from warping. Carrot Muffins: Preheat oven to 350 degrees F (180 degrees C) and place rack in center of oven. Place paper liners in 12 muffin cups. In a large bowl whisk together the flour, sugar, baking soda, baking powder, salt, and ground cinnamon. Stir in the nuts and coconut. In a separate bowl whisk together the eggs, oil, and vanilla extract. Fold the wet ingredients, along with the grated carrot and apple, into the flour mixture, stirring just until moistened. Evenly divide the batter between the prepared muffin cups and bake for 20 - 25 minutes or until a toothpick inserted in the center comes out clean. Remove from oven and let cool on a wire rack. After about 10 minutes remove the muffins from the pans and cool completely on a wire rack before frosting. Frosting: Beat the butter and cream cheese until very smooth with no lumps. Gradually beat in the powdered sugar until fully incorporated and smooth. Beat in the vanilla extract. Place a dollop of the cream cheese frosting on the top of each muffin.